Everyone kinda knew that Allegiant wanted Tate to defend his series placing from last year. We just didn’t know how they were going to do this. Race starts and of course and Allegiant is attacking before we make the first turn (100meters away). We get out of town, Grill goes with Shackley and one other rider. Allegiant seems ok with it, I figure that Tyrel and Tate will bridge later on so I am content to try and go with that move. About 10 miles in, Kevin and two other riders get a gap, and I hear Tyrel tell his team to not worry about it. Kevin’s group catches Grill’s group and now 6 in the break. We hit the first turn around and are told 4 mins, but it seemed more like 3. This is when I hear Isiah tell someone, let’s bring it back. The entire Allegiant team of 6 goes to the front and start team time trialing the break back. The rest of us sit in getting a free ride. I spend the next 30 miles waiting for Tyrel and Tate to bridge but it never happens and the gap really isn’t coming down. 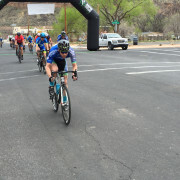 60 miles in, the gap is just under 3 mins, Allegiant only now has 3 guys pulling, Tyrel, Isaiah, and Jed. We are coming to the first climb, gap is now 2 mins, we can see the lead goup which is now only 3. Kevin, Shackley and one other rider. We hit the climb at a solid tempo, Tyrel attacks and the group is down to 4 or 5. I am managing well, but others look to be hurting. I knew Tyrel was never going to leave Tate behind, so I was in a good spot knowing I had some in the tank still. 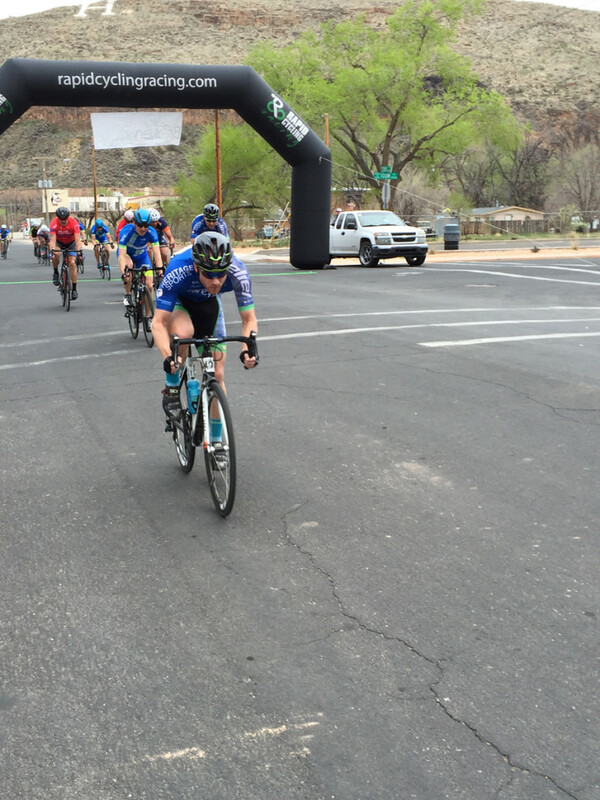 Over the top, the gap is 1:30 and Tyrel is back on the front towing us to the next climb. We are closing fast though. We go over the top and I can see Kevin doing most of the work. We make the catch just as we are coming into town, and now things get tricky since nobody really knows where to go or where to turn (The promoter had to employ city volunteers that did not the course.) Kevin tells me he is blown, expectedly after being in the break forever. I try to key off a S2C rider since he is sitting on Tate’s wheel and Tyrel is going to lead him out. It gets a bit chaotic since we are blowing through stop signs and not knowing if we are taking the right turns, then a car pulls out in front of us and slows down! I am just trying to follow wheels and not get killed. I had no idea the last turn was the last turn until a we made the turn, Tyrel wins, Kocher goes by Tate for 2nd and I go past Tate for 3rd. I’ll take that after 80 miles. Kevin get’s 6th which is great after being in the break forever! Grill did an impressive effort in the crit after this which was awesome. Somehow I end up in 3rd overall for the entire series. I jumped into this at the last second after talking with Mike Thursday, and I am glad I did, lot of fun just hanging out. 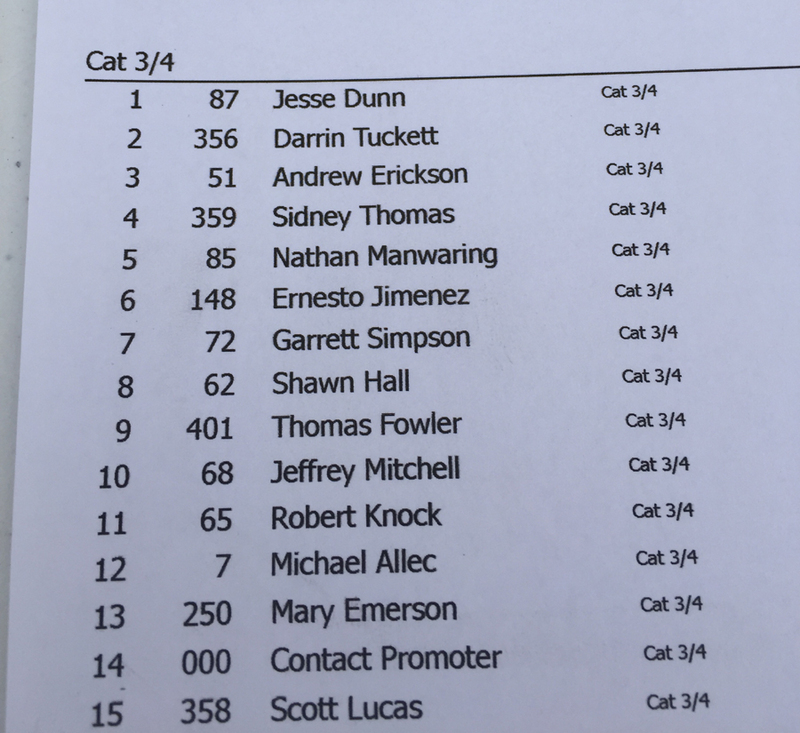 Also awesome to see the team do well in the 3-4 races also. A great weekend for the team! I think there were 15 guys at the start? Everyone had done the road race. Plan was to mark Tate and get Kevin or Elliot into a move with him and if it came down to a bunch sprint, the guys would line it up for me. 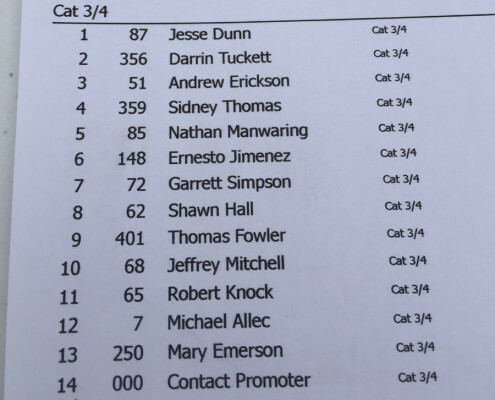 Well, Allegiant took the front almost immediately and within 5-8 laps, half of the field was gone. Two Allegiant guys gone already. Elliot made a move and then so did Kevin,but with the small field, nothing was going to get away. From that point, I made sure to stay on or near Tate. Allegiant was just riding tempo at the front, exchanging between Shackley and Tyrel. At 3 to go, I had Elliot and Kevin get in front of me. At 1.5 laps to go, Kevin started it and came on the inside of the Allegiant train on the back straight. Elliot missed it, but it was okay and Kevin kept it hot for am entire lap. It was great. Out of turn 2, he skipped his wheel and lost some of his momentum and I was going to have to take it from 500m/half a lap. Suddenly, Tyrel pops out, looking for Tate to get on his wheel. I oblige and I’m glued to him until the last corner, where I jump, nobody’s coming around. 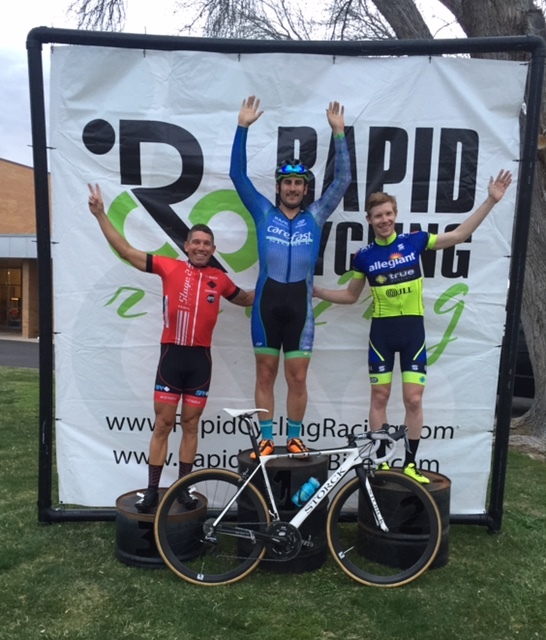 I take the win to close out a great weekend of racing! The TT was an out and back 9.1 miles final results had Tony 3rd and Mike 4th. Mike, Jeff, Tony, Tyler, and myself were in a field of 25 or so for this 60 mile out and back. We wanted to ensure Tony’s series points status stayed intact. Aside from that, we wanted to control the race and follow any opportunity that opened up. About 15 or 20 miles into the race I followed an SBR guy and the infamous Charlie Macfarlane as they sprinted away. 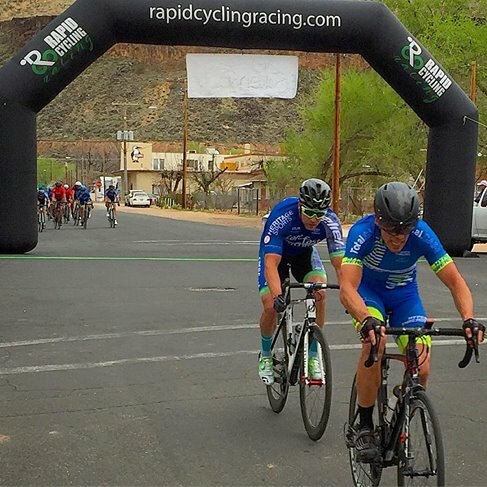 I had no interest in working with them and I made that clear when an obnoxious rider ever so eloquently requested that I pull through to help hold the pace. A few four letter words were sent my way and the field caught us. The two big climbs coming back were hot, but not deathly. All of us gathered together after the first but the second climb took its’ toll. 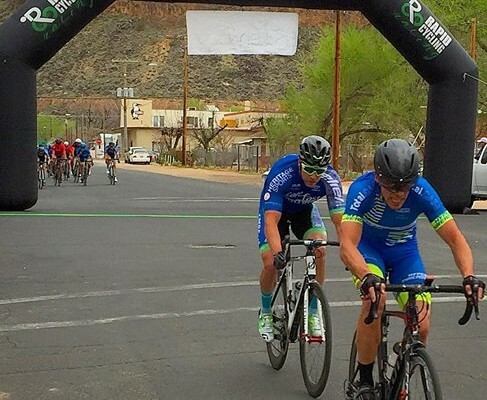 Tony flatted on the top and Tyler decided to stay with him to provide help if there was any way to pace back but the lead group was descending and they had a delay at the wheel car. Mike and myself continued with a group of nine with one Total Care guy off the front. His teammates did a solid job of interrupting efforts to catch. Coming into town we were improperly told to go straight through a 4-way stop where we should have turned right. This led us onto the main town road and we found our way back to the finish via a gas station and parking lot. Keep in mind we’re very much still racing. 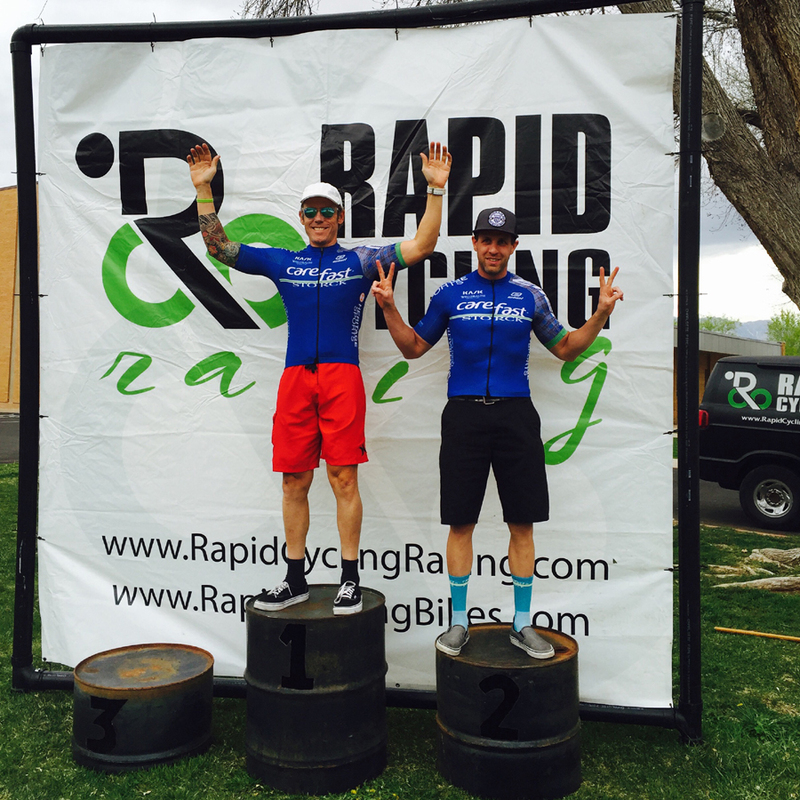 We had the finish line in site, albeit from a 90 degree angle, with only the registration tent as our final obstacle. We raced around and I crossed the line 2nd in the group, 3rd overall. The Total Care racer stayed away and to his credit rightfully earned it. We controlled the race extremely well for about 75% of the time and the field respected our efforts. As Mike already said, it was a genuinely great weekend for us all. The hard work put into every race was rewarded every time. Mike, Tyler and Andy lined up, all around our legs were not fresh after the 60 mile road race prior. 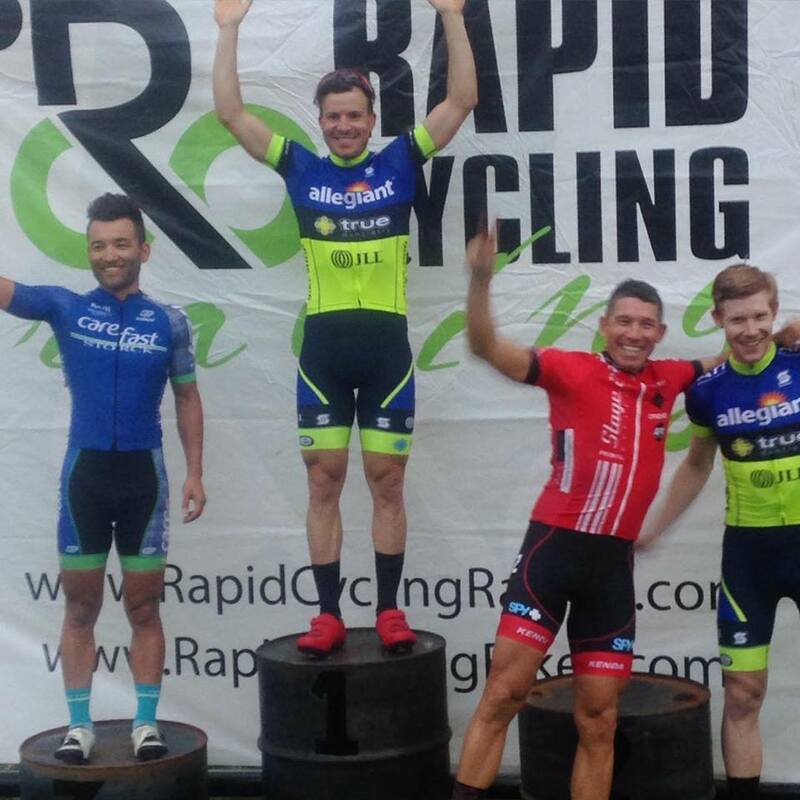 Tony Rago sat out for the Crit, having the series title on lockdown and battling respiratory issues, recovery was prudent. Tyler went out on an early break away with Sidney Thomas and a Total Care racer, max gap hits 45 seconds. Mike and Andy and I chase down any bridge attempts. Ultimately as a result of the Total Care racing team, the break was caught 25 minutes into the race. Several failed attacks subsequent from Total Care, SBR etc. nothing sticks. 2 laps to go, Andy gets on the front and I’m on his wheel, I tell him to keep it hot so the race stays strung out, he does just that, beastly pull, I’m pushing to stay on his wheel, it’s perfect – everyone else is struggling too. He takes us to the first corner of the last lap and on the straight away he tells me he’s done, so it’s go time – I don’t want to lose momentum so I hit it, throwing down a BIG effort through the last 3 corners, I’m still on the front, no swarm so I gun the final sprint and the Total Care lads can’t match the pace, I take the win with about a bike length. Great racing by everyone. 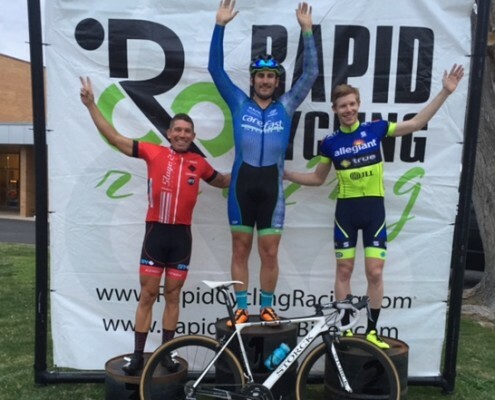 Awesome weekend of racing! 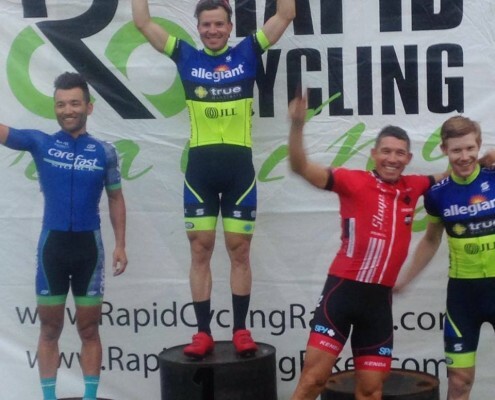 Due to Jeff’s stellar performance this weekend, and Andy and Mike holding others off in the RR and Crit, he was able to catapult to the 2nd spot in the overall series in the Cat 3/4! 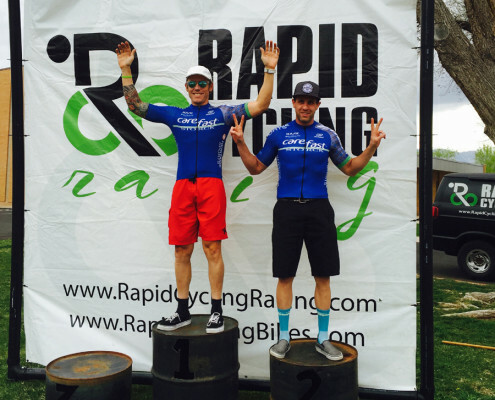 Carefast takes 1st and 2nd in the Desert Crit Series. Congrats Tony and Jeff! Amazing job by everyone on the team through out this entire series!